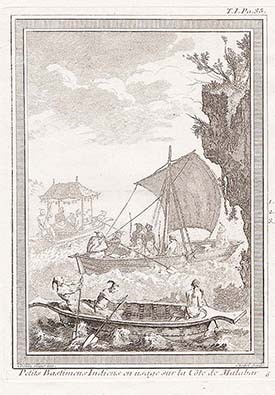 Representation of natives on their boats at the coast of Malabar, in south India. Engraved by Pierre Quentin Chedel after Charles Nicolas Cochin. Circa 1747. 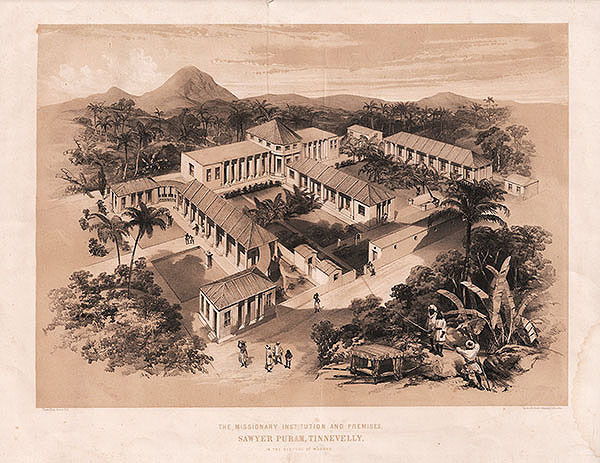 The Missionary Institution and Premises, Sawyer Puram, Tinnevelly, in the Diocese of Madras. An antique sepia lithograph by Maclure Macdonald & Macgregor, London after Llewellyn Jewitt. Circa 1850. A little grubby in the margins, a few old folds and a repaired tear in the bottom margin. 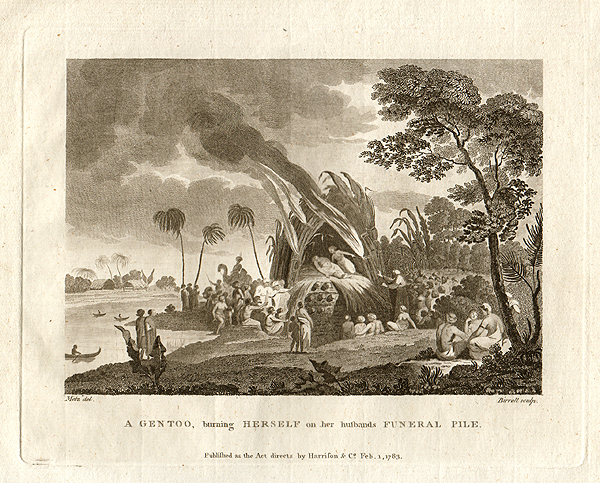 A Gentoo, burning Herself on her husbands Funeral Pile. An antique line engraving by Birrell after Metz. Published as the Act directs by Harrison & Co Feb 1, 1783." 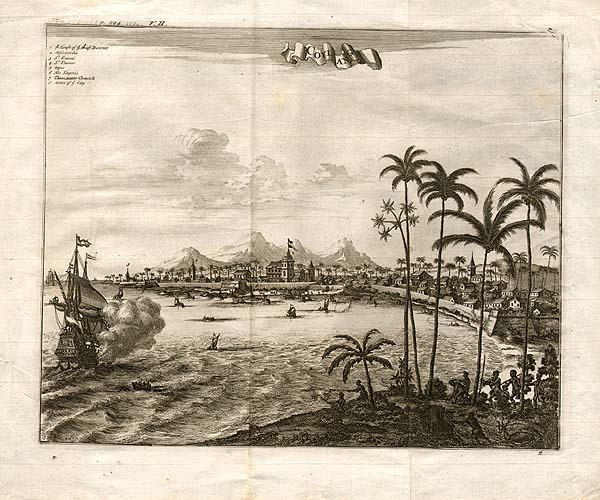 More Info An antique line engraving of the Portuguese colony of Coylang on the Malabar coast of India, under attack by the Dutch during the 16th-17th century struggle for empire between the two countries. The local inhabitants are fishing off the bank in the foreground. Engraved by Johannes Kip. Published by Johann Nieuhoff. Circa 1682. Has two vertical folds. An antique line engraving of the Portuguese colony of Coylang on the Malabar coast of India, under attack by the Dutch during the 16th-17th century struggle for empire between the two countries. The local inhabitants are fishing off the bank in the foreground. Engraved by Johannes Kip. Published by Johann Nieuhoff. Circa 1682. Has two vertical folds. 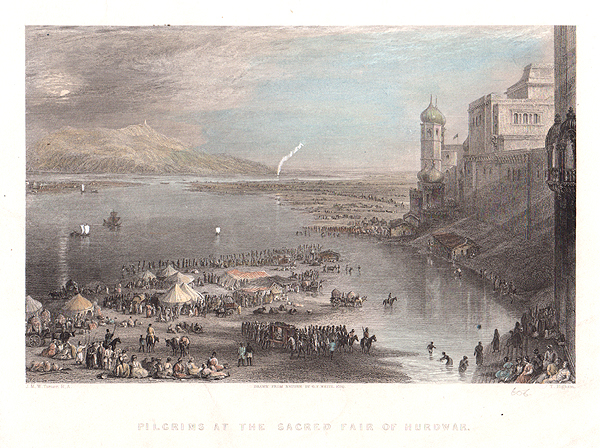 Pilgrims at the Sacred Fair of Hurdwar. An antique line engraving by T. Higham after J.M.W. Turner. R.A. Published in 1844. Later coloured by hand. Janghera, or the Kakeer's Rock, on the Ganges. An antique line engraving by J. Sands after C. Stanfield. R.A. Published in 1838. Later coloured by hand. Kursalee, a village in the Himalaya Mountain, India. An antique line engraving by J. Appleton after C. Bentley. Published in 1838. Later coloured by hand. Gungootree, the Sacred source of the Ganges. An antique line engraving by J.H. Kernot after T. Allom. Published in 1838. Later coloured by hand. An antique line engraving by T. Barber after A.G. Vickers. Circa 1845. Source of the River Jumna, India. An antique line engarving by W. Taylor after C. Bentley. Circa 1845. Later coloured by hand. Mussooree and the Dhoon, from Landour. An antique line engraving by J.B. Allen after J.M.W. Turner. R.A. Published in 1845. Crossing the River Tonse by a Jhoola. An antique line engraving by H. Jordan after W. Purse. Published in 1838. It has been coloured by hand. Valley of the Dhoon, Himalaya Mountains. An antique line engraving by W. Floyd after J.M.W. Turner. R.A. Published in 1845. A view of the Fort of Gwalior from the N.W. An antique line engraving by Morris. Published in the European Magazine. Circa 1820. An attractive little line engraving which has been coloured by hand. Circa 1860. The East India Railway : Sursuttee Bridge and Viaduct. A woodcut engraving which was published in "The Ilustrated London News". Circa 1870. The Great Indian Peninsula Railway. Woodcut engravings which appeared in "The Illustrated London News" on July 8th, 1854. Views include "View from Sion Hill - The Railway crossing the marsh", "The Byculla Station" , "The Eastern Tunnel" and "The Flats from Sion Hill". The Ganges Canal, at Boorker. A woodcut engraving which appeared in "The Illustrated London News" on August 5th, 1854. A Woodcut engraving of which was published in "The Illustrated London News" on 10th November, 1855. A line engraving by A. Willmore after T. Allom. Circa 1860.